The coming weekend marks the 10th anniversary of Lehman Brothers filing for the largest-ever bankruptcy in the US. Few economies were unaffected by the subsequent global financial crisis (GFC) and India was no exception. A quick review of India’s pre- and post-crisis experience would be instructive in order to focus on a key issue currently affecting the rupee. This issue appears to have escaped the collective wisdom of Indian policymakers. The GFC punctuated India’s best-ever multi-year growth performance beginning in 2003. Economic growth broke away from the trend by jumping to 8.1% in 2003-04 (India’s fiscal year ends on 31 March), and averaged a stunning 9.2% annually between 2003-04 and 2007-08. It peaked at an unprecedented, and unsustainable, 10.2% in FY08. The unexpected jump in India’s growth was powered by a propitious mix of strong global growth, surge in global liquidity (thanks partly to dollar depreciation), and India’s favourable domestic factors. India wasn’t the only economy to post impressive growth in the years running up to the GFC. The International Monetary Fund (IMF) calculates that world gross domestic product (GDP) growth averaged an unprecedented 5.1% annually in 2003-07, with all regions, including Sub-Saharan Africa, posting acceleration in growth. Essentially, the mother of all global liquidity cycles lifted all economies, despite a manifold increase in international crude oil prices. India’s impressive investment-led growth collapsed to 4.2% in 2008-09 as the full impact of the GFC was captured. Luckily, healthy fiscal and external balances offered room for a coordinated aggressive mix of fiscal and monetary response. This, along with improving global risk appetite following unconventional quantitative easing by key central banks, pushed up growth to 8.8% and 10.8% in FY10 and FY11, respectively. The rebound was unsustainable and growth plunged, to 6.7% in FY12. Delay in the timely and sufficient withdrawal of the expansionary fiscal-monetary mix that had cushioned the hit from the GFC contributed to sharply higher inflation and a related rush to hoard gold (best thought of as a form of capital flight). The current account deficit (CAD) blew out, to an unsustainable high of 4.8% of GDP in FY13, despite the deceleration in growth in FY12 and FY13. Policymakers ignored the glaring warning sign of unsustainably high CAD being financed substantially by volatile capital inflows. This set the stage for the rupee to visit the ICU during “taper tantrums" in 2013. The rupee recovered following the Reserve of India’s (RBI’s) cloyingly sweet lollipop to non-resident Indians (NRIs). Frankly, few would have anticipated the current talk of raising money from NRIs so soon after the 2013 debacle. While India is in better shape today than 2013, why is there nervousness over the rupee’s depreciation and why does it fall out of bed every few years? Global factors alone, often the first line of defence for politicians, don’t offer the complete answer. The rupee dynamics since 2003 have been an interplay of global liquidity, crude prices, and India’s GDP growth and inflation relative to its trading partners. 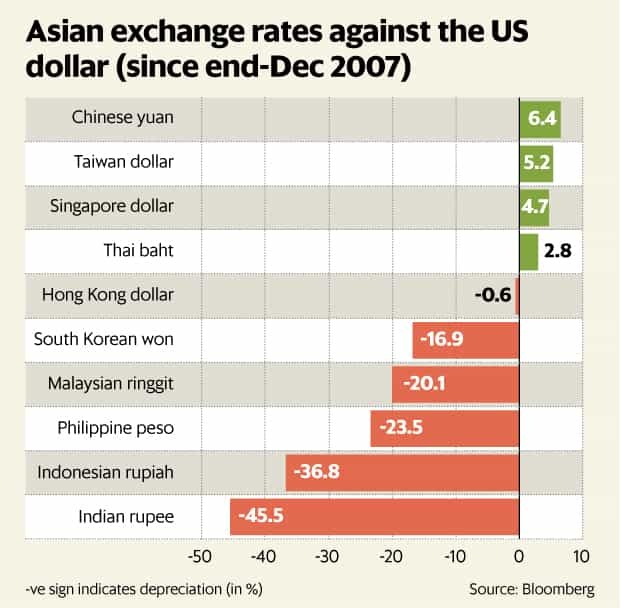 Between 2003 and 2007, the rupee was under tremendous pressure to appreciate despite a dramatic jump in crude prices. This was because copious capital inflows, thanks to the unprecedented global liquidity cycle, more than offset CAD. As India’s subsequent experience proved, such an outcome cannot be relied upon. Liquidity cycles balloon gradually and it is a mug’s game to precisely time their event-driven sudden reversal. Consequently, countries that run chronic CAD have to be particularly careful. Their policymakers must avoid being swayed by propaganda of a new paradigm that prompts adopting a riskier strategy to achieve the “entitlement" of higher growth. The relevant figures are smaller, but the current palpitations over the rupee’s outsized, but necessary, depreciation is largely a script that has played out before: A widening CAD, nearing 3% of GDP, that is inadequately financed by long-term stable foreign capital. This mix makes the economy vulnerable to a reversal in capital inflows. That the widening in CAD deficit is in the absence of a sustained upturn in investment makes the situation more precarious. Policymakers, bureaucrats and politicians need to appreciate that the rupee’s depreciation is part of the solution, not part of the problem. The Pavlovian suggestions of preventing depreciation or tapping NRI money whenever the rupee comes under meaningful pressure misses the basic point that the problem isn’t just a one-time issue of availability of dollars. India’s macro stability in recent years has been a warrant on crude prices and global liquidity. The former has already reversed the widely cheered manna from heaven for the government and the latter’s unfavourable direction is set. Macro stability isn’t just a fair weather outcome. The challenge for India is to finance aspirational growth of 8% or higher on a sustained basis while ensuring macro-prudential stability, including by limiting CAD to, say, 2-2.5% of GDP with stable financing. This doesn’t appear to have been in focus or else policymakers wouldn’t be caught off-guard by the hit to the rupee. The rupee’s depreciation ride isn’t over even if it finds some near-term respite. Further tightening in global liquidity is on the cards, as is improvement in India’s growth trajectory. The twin deficits are already heading in the wrong direction, and the inflation risk in the next couple of years is being underappreciated. The RBI will need to respond with a series of rate hikes. The latest punch to the rupee is just yet another wake-up call. Rajeev Malik is a strategist at River Valley Asset Management, Singapore. These are his personal views.